Tis said of that ancient brooding forest that even before the world grew accustomed to the light of day, that her stems were grown high and her eves already dark. 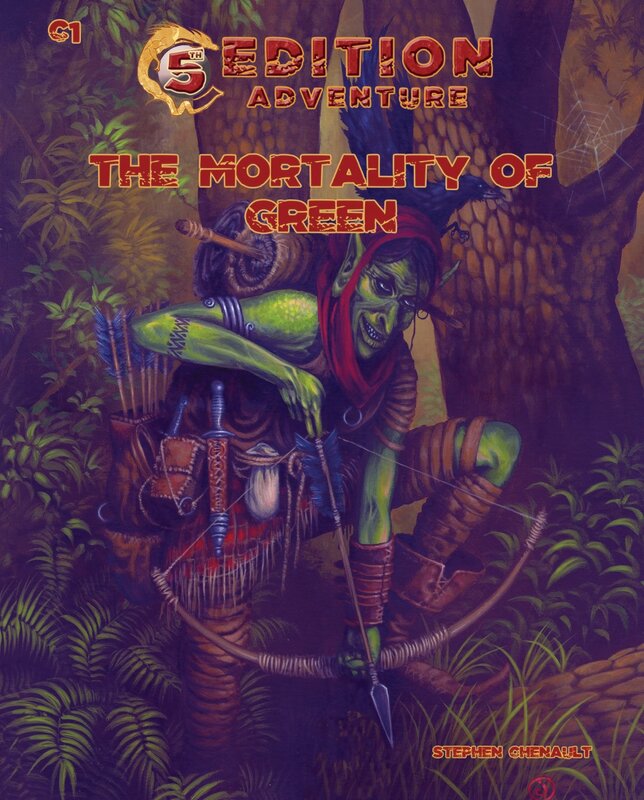 The Mortality of Green is designed to be a fast-paced adventure wherein the characters are thrown into the immediate pursuit of a brigand troll. The troll, Quagmire, has stolen a young sapling from the druid Cornelius and fled into the forest. The characters must rescue the sapling before it is planted in the ground. Failure to do so results in the sapling’s corruption and probable demise. The Morality of Green offers enough introductory material to the Darkenfold to keep the players engaged in adventures far beyond this written adventure. Furthermore, there are several small adventures encapsulated within these pages in Gnomish Dreams, The Broken Vale and The Fisherman to offer the Game Master and players plenty of distraction. This adventure is designed for 4-8 characters of 3-5 levels. Overland. Explore the Darkenfold futher with all the “C” series of adventure modules!